New Year’s Day! ! Woke up to a cool but sunny new year! We are off to catch up with John and Tillie who are already in Tucson. But first we are heading to San Antonio to see The Alamo. We have been told there is not much to see, but of course we had to see for ourselves, say we’ve been there and done that. Found a Walmart to park the RV; unhooked the car and headed into San Antonio. It was not hard to find. Parking was awful, lots of it but very expensive. We found a parking garage that has gone hi-tech. They only accept credit cards. Because of the holidays, The Alamo was very crowded with families, teens and couples and of course sightseers like us. It was free admission, but they did ask for donations. That and sales of souvenirs is their only means of support; no state or federal funding. They have done a lot of work on The Alamo and it still undergoing renovations. No indoor photography is allowed because it is considered hallow ground where so many heroes of Texas lost their lives. We got back on our way hoping to get further across Texas by the end of the day. We are still moving as I write this. Goodnite! We spent the night at the smallest Walmart I’ve ever seen in Ft. Stockton, TX. We are on the road again, heading west once more. Although the vistas are beautiful to see here in West Texas, there is also not much out here; no oil rigs, no cattle, no houses, nothing. This is a good place for me to practice my driving skills on the motorhome. I’m getting better, got to pass an 18 wheeler and another motorhome. But I don’t want to do any city driving just yet. We got a call just after lunch that we are expected at Jim and Judy’s for dinner along with John and Tillie. It was another long day of driving, all the way to Tucson. Had a wonderful dinner with friends, but had to leave early due to unexpected stomach problems. Was so sorry to go home. We were able to fuel up in Tucson for $3.07/gal for diesel!! We were very thankful. Out tank was very low and the cost of fuel is hovering between $3.29 and $3.37. We even saw it advertised for $3.79 ! This was our last day of driving for a while! There is not much out here between Tucson and Yuma as you can see from the pictures. But the closer we got to Yuma, the more we saw fields of cotton being harvested, pecans tree farms also. There is an austere beauty in the Sonoran Desert. The Squarro Cacti look like leftovers from an earlier age. One also trys to imagine cowboys riding from town to town out here; just doesn’t seem feasible on horseback because towns are so far apart. Where in the world did they ever find water? Why did the United States round up the Indians and place them on reservations. This land is still not settled by the white man! Who wants to be out here when it’s a 120 degrees in the summer time? We arrived in Yuma early afternoon and got up to Senator Wash by 2:30. We are now located on the lower portion of Squaw Lake below the dam reservoir on paved parking. There are bathhouses here with pay showers, $1.00 for 5 minutes minimum. Spaces are wide but not very deep. 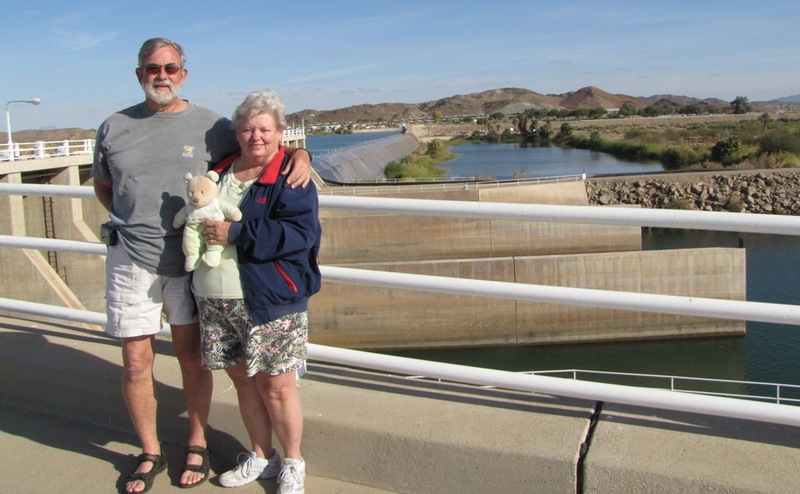 We are on the California side of the Imperial Dam, just up the road from the Yuma Proving Ground. After filling our water and emptying our waste tanks we are now set for several days. We can sleep in tomorrow! We are going to stay on Arizona time so we can keep up with Yuma. After dinner, played some cards with John and Tillie before saying goodnight. Bob and John have set the routine for the day by taking their morning walk. Later on we had to go set up our mail delivery at the Christian Service Center and get passes to get on base down at Yuma Proving Ground. The RV’ers are a world unto their own out here. 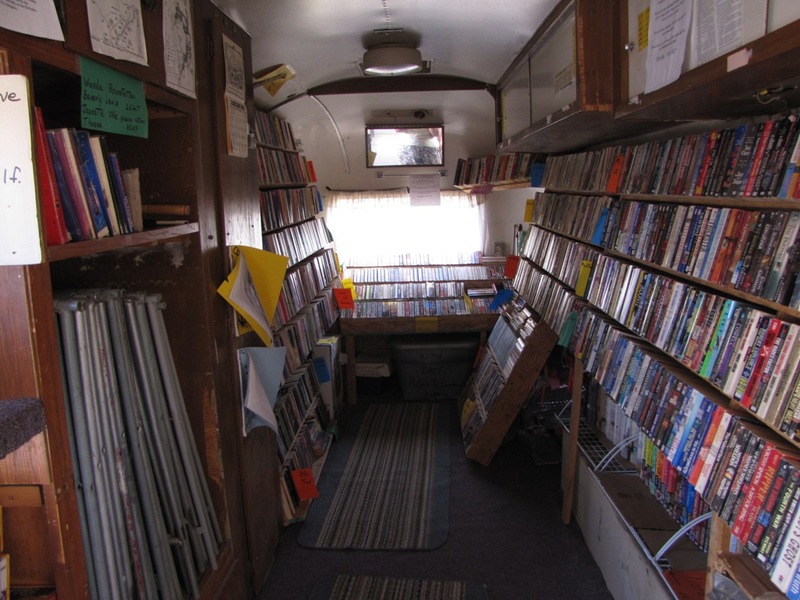 There is a CB network and directory, a library in a trailer run by volunteers, a newspaper of sorts, neighborhoods (defined by names such as Hurricane Ridge, Skunk Hollow, Coyote Ridge, and Cozy Cove), and probably much more that we have not discovered yet. Give us time, there is so much more to do. They are advertising teeth cleaning in Mexico for $20.00! I’ve invited our neighbors for pork and sauerkraut dinner before we headed out to the free movies over at the Army base. Coming home from the movies we saw 4 burros feeding on the side of the road. Today we headed into Yuma to stock up on provisions, ate at “Da Boyz Pizza and Pasta”, stopped and picked up some Red Flame Raisins at a produce stand. They are big, tender and very moist. We also decided to try a “Plumelo”. They said it is a first cousin to a grapefruit but is much sweeter. Will have to let you know what it’s like later. After dinner, we got together with our friends to start planning our trip to Alaska. Can’t wait. The “Plumelo” wasn’t much to rave about. The skin was much thicker than grapefruit (almost an inch thick) and, while not sour like grapefruit, it wasn’t much sweeter. Bob, John and I went exploring the road to Ferguson Lake while Tillie went to town. 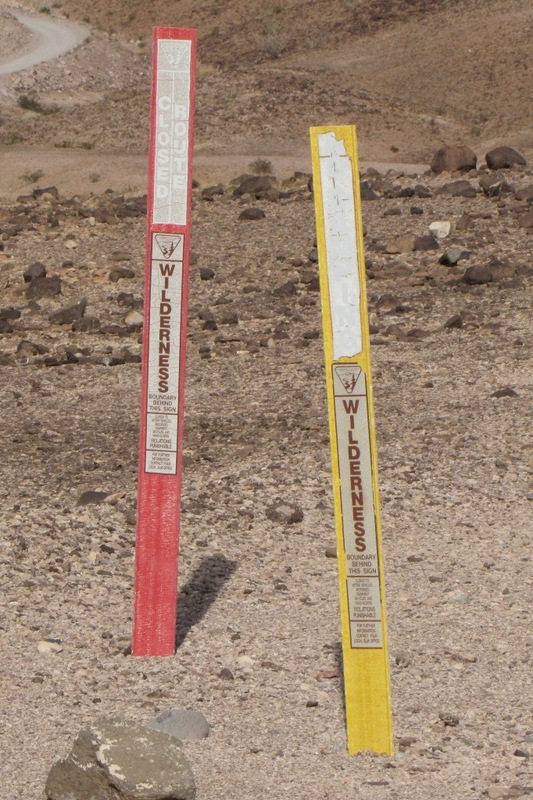 You are definitely headed into the wilderness on this road to nowhere. It’s a barren landscape that has an austere beauty about it. Sometimes pictures say it better. 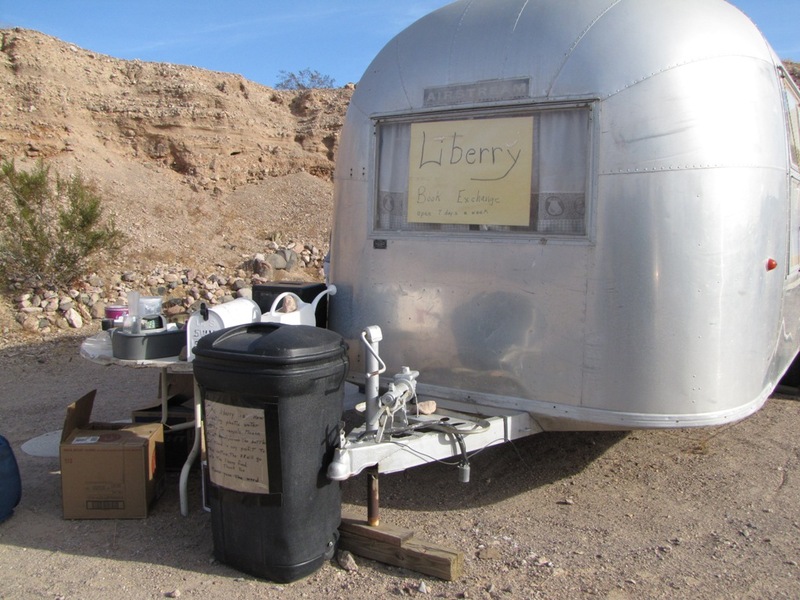 We headed for the Flea Market in Yuma today. Looking for a new outdoor rug for the RV. Came home the back way on S24 and stopped at Sun Gardens for Date shakes, YUMMY! We were riding up on the Mesa when we came across these burros, mother and child. They we not afraid of us. The youngin’ came right up while the mother kept watch. She finally came walking up also. We were upset because we didn’t have any carrots to feed them. They love them! We also drove down to the Imperial Dam. This year we were able to walk across the dam. Last year it was all blocked off. It is here that the water is divided into 3 sloughs. One continues as the Colorado River; one goes into the ALL AMERICAN CANAL, which serves as a water source for farmers in Arizona as well as farmers over in the Imperial Valley of California. The third one provides water for Los Angeles. To the right are pictures of the Senator Wash Liberry! Someone donated this trailer and volunteers maintain the books inside. There are also puzzles, maps, lots and lots of fiction and non-fiction as well. This is all free for the visitors of the Senator Wash LTVA. (Long Term Visitor Area). John woke up this morning to discover he had big inverter problems. Spend a good part of the day finding someone who could work on it because they don’t make that kind anymore. Went to dump today. Made it for 8 days. We can do better now that we know just how careful we have to be with water distribution. It was sunny and cold today because the wind was blowing so hard out of the north even though it was 60 degrees. John had to go into town to get parts ordered for his inverter. We drove in later to get a refill on a prescription. 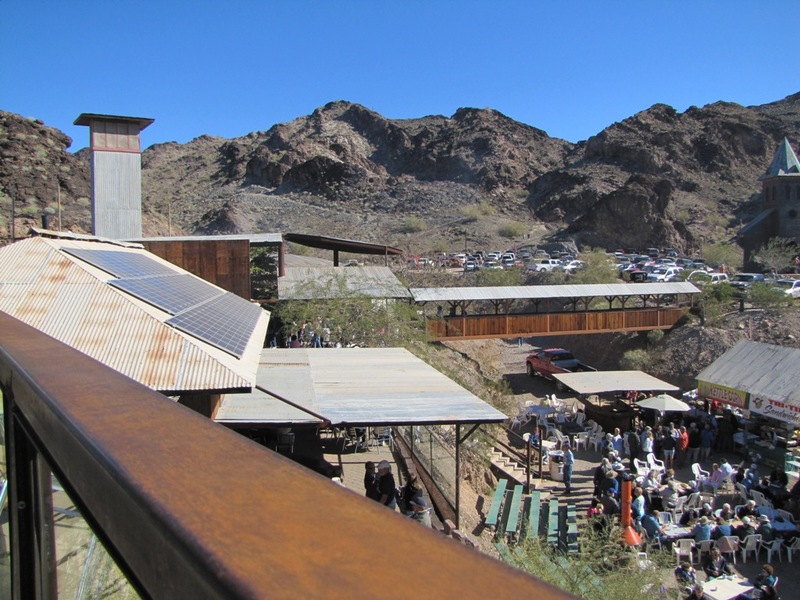 Had lunch at “On The Farm”, a place under new management, on AZ 95. Wonderful quesadillas and tacos. Another date shake for Bob! Rise and shine! On our way to Mexico; hopefully to get new glasses. Maybe a little Tequila also, si! John and Tillie went with us. We parked and walked over the border. Bob and I both got glasses, we bought our liquor and we were headed back to the US by 11:15 am. (They don’t start selling liquor until 11 am in Mexico.) Stopped by Sam’s Club to pick up supplies then headed home the back way. 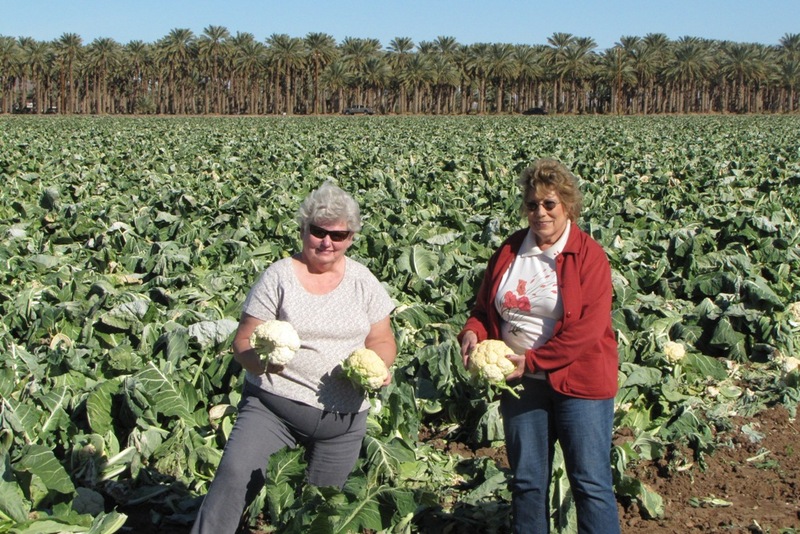 We heard they had just cleared a field of cauliflower. We were able to pick up several head and a little further down the road there was some fresh Romaine lettuce that had just been harvested. Talk about fresh from the field! John arrived with his inverter, controller and transfer relay for his conversion to a standard inverter installation. 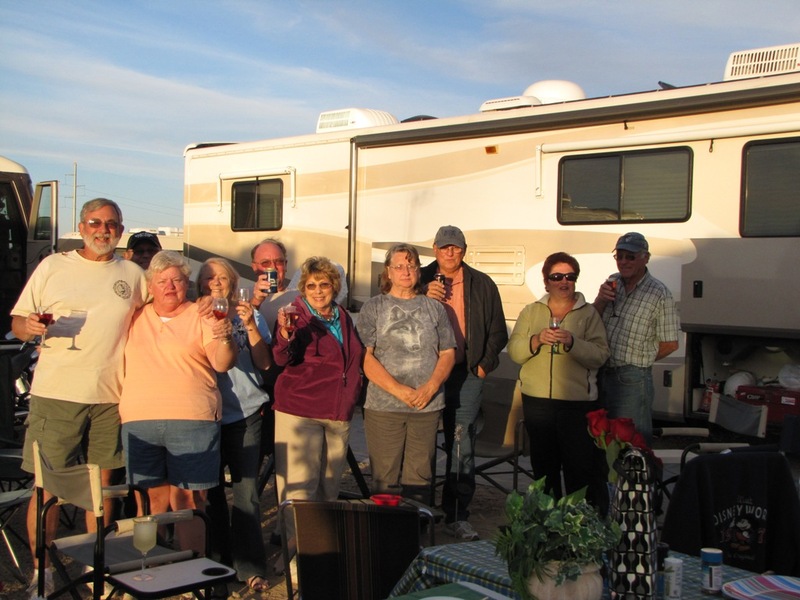 He discovered that the man who designed the inverter implementation for the American Eagle was in Quartzsite for the RV Show, and that he would make the modifications to install the standard inverter for him. He has that work scheduled for Wednesday. We now have 3 of the four couples who will make up our wagon train. Rick and Becky left today for San Jose, CA, where they are going for a surprise party for their son’s 40th birthday. The RV Show opened today. The place was jammed. Needless to say, we didn’t go. Went to the Desert Bar. Arrived just a few minutes after 12 pm and the place was already full. For a place that doesn’t open until high noon that says a lot about the kind of business they do. Patsy and Ol’ Roy have arrived from Houston, TX. Rick and Becky return from San Jose. The wagon train is now complete! TADAAAA!!!!! Today is my birthday, AND John and Tillie’s wedding anniversary! Celebration Time! I feel a party coming on! We grilled steaks, with baked potatoes and a salad. With a birthday cake for dessert. Brenda and Laverne joined us for dinner. It was a really great evening for being out in the desert. We must not forget the roses that John and Bob gave us for our respective celebrations! We love you guys! ! ! 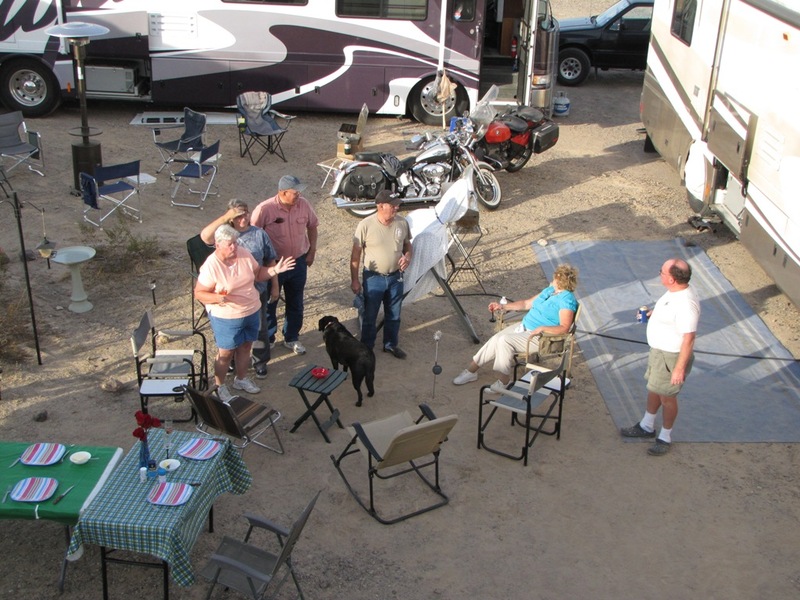 We took Rick and Becky down to Yuma for the day. 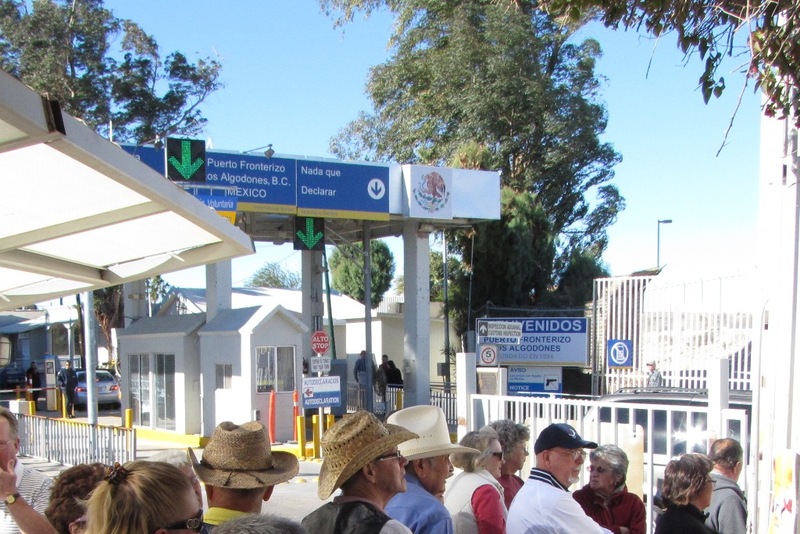 They didn’t bring their passports so we could not go into Mexico. Had lunch at “Da Boyz” again. Went over to the flea market where we picked up an original Dirt Shirt. Drove them through the Salad Bowl of America and then stopped for more Date Shakes! Tonight was Carol’s Famous spaghetti dinner! Back to the Desert Bar with the gang since Rick and Becky has not been before. It never really seemed to get as warm as the last time we were here. They are offering more food than what they did last year and their Tri-Tip steak sandwiches are very tender and delicious! 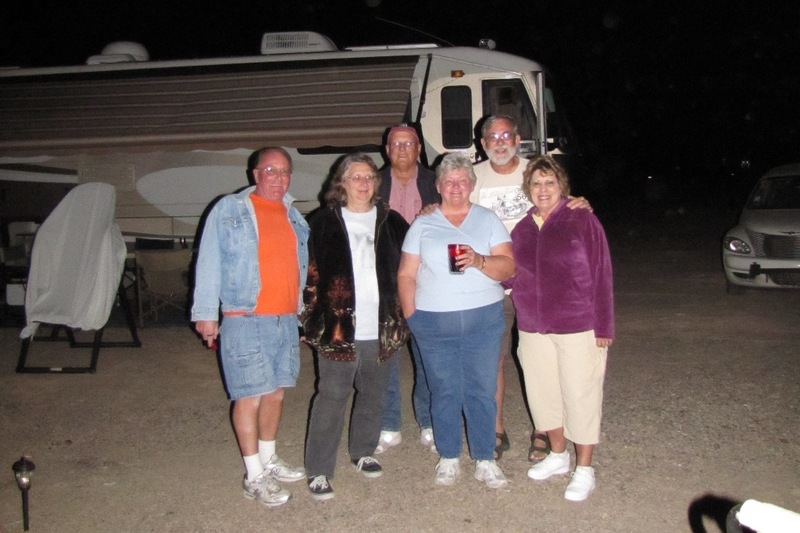 We headed on home while J, T, P, R stopped at the Bluewater Casino in Parker, AZ. 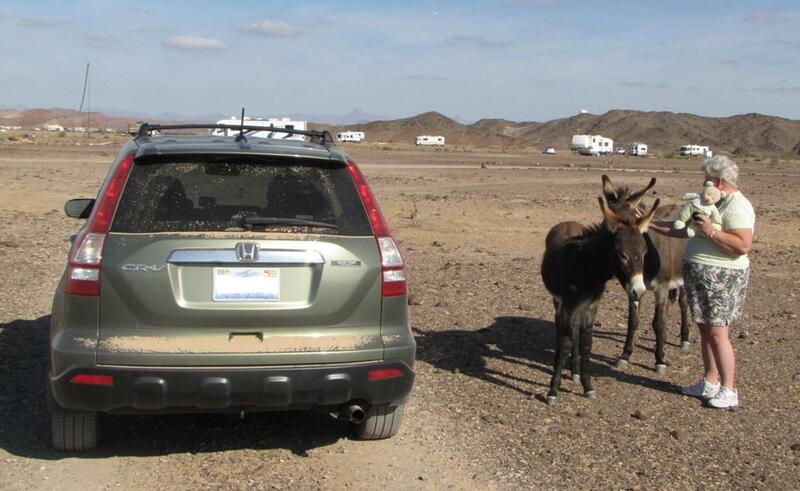 Took Rick and Becky back into the desert for a scenic road trip, through the gullies and the washes. Stood next to a squarro cactus that had to be at least 30 ft tall. Most of the dirt roads back here are made for four wheelers and high clearance trucks.